The 2pps ditter has not been heard here for the past hour on any of the previously logged frequencies. I think I may have caught the same thing last night, 8000 KHZ 0400 UTC 4 Dec 2018. Listening via an SDR in southern Nevada on SDR.HU. Roughly 2 pps. I used a metronome to time it at 125 bpm. Dec 06 2018 O145 UTC on 6500 & 7000. Highlight of this report: Clear audio recording of the 2pps frequency hopping ditter. 5500.00 kHz CW, frequency hopping ditter, good readable, -110 dBm. 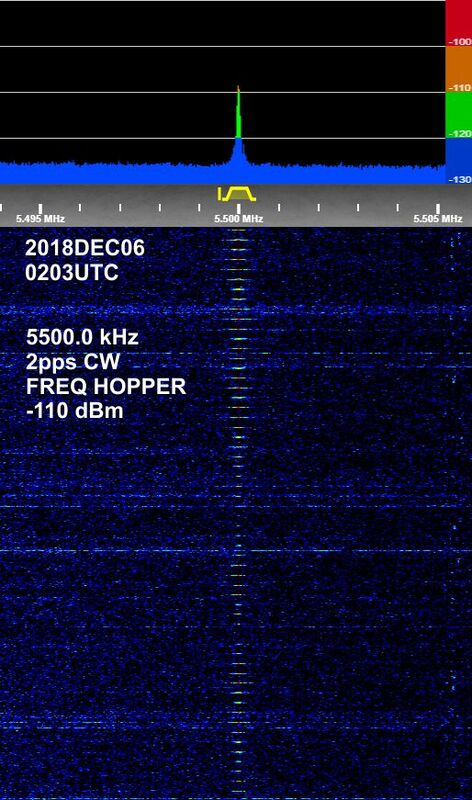 2018DEC07 0132UTC The 2pps frequency hopper appears to be offline at this moment. It is not being logged here now on any of previously logged frequencies. 0230 UTC - 6 Dec 2018, hearing 2PPS tonight on following frequencies in WNY: 4000, 4500, 5010, 6500, 7000, 7500, 8000, 8500, 9000 kHz . And 26 would be the right number. If the signal is sequencing through the freqs as it appears to have been when I looked at it, then we should be able to tell the maximum number of possible freqs based on the pulse width and time. If you look at the numbers I posted (in my post with the audio images), and if they are correct, 479.6 msec period and 18.4 msec pulse (both numbers are rounded to the closest 0.1), this allows for 26 steps / frequencies. Since all of those "not logged" freqs have been seen at one time or another, that would probably indicate that they do change frequency sets and that if you don't see a specific freq in use at a specific time it might not be conditions, but it might be the freq really is not active. I heard it today Dec 6 about 2300 UTC on the frequencies below (checked every 500 kHz from 2.000 to 16.000 MHz). Later when checked at about 2330 it was gone on all of them. I also didn't hear it on 4.500. Taken as a whole, considering the reports on HFU and elsewhere, the 2 PPS has the typical characteristics of someone testing an antenna system for a (low power ~20 Watt) frequency hopping radio system, out in The Southwest. 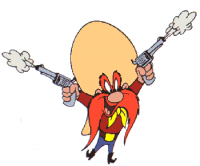 Is 2PPS the "Son Of Yosemite Sam" ? It hops in a sequence like Yosemite Sam did, but faster and more frequencies.